Make your selections below to check rates and make a reservation at Sherwood Forest RV Resort. These stylish cottages are conveniently close to the clubhouse. They are ready for you and and your pet. The bedroom contains a comfy queen-size bed and 2 nightstands. The cozy loft houses an air mattress that provides an additional sleeping area that is great for kids. The 3-piece bath contains a shower. The roomy kitchen is well-appointed with a full-sized refrigerator, electric stove, oven, microwave, coffee maker, toaster, and dinnerware for 4. The dining area houses a table that seats 4. In the living area is a loveseat, full-size sleeper sofa, and 32" flat screen TV. Outside, a covered front porch provides welcome shade. Pets are welcomed in this cottage. A 3-day minimum stay is required for these rentals. See our policies page for information about pets in our rentals and details about WiFi availability: http://rvonthego.com/florida/sherwood-forest-rv-resort/policies. 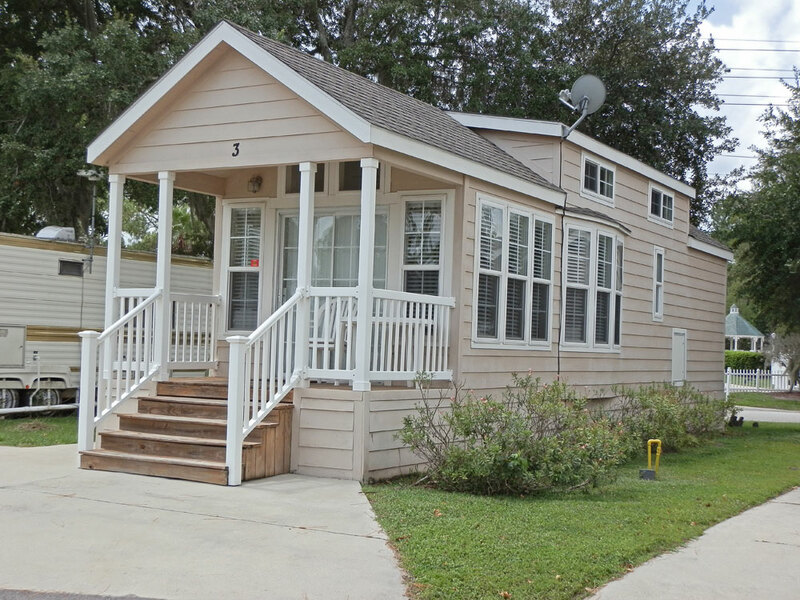 These occupant-ready stylish cottages have a charming front porch that provides welcomed shade. Sit out and enjoy an afternoon on the patio with a refreshing glass of iced tea. The bedroom contains a comfy queen-size bed and 2 nightstands. The 3-piece bath contains a frosted glass, sliding door shower. The roomy kitchen is well-appointed with a full-sized refrigerator, dishwasher, electric stove, oven, microwave, coffee maker, toaster, and dinnerware for 4. An in-home washer and dryer provide added convenience. The dining area houses a table that seats 4. In the living area is a loveseat, full-size sleeper sofa, and a 32" flat screen TV. No pets in these rentals please. A 3-day minimum stay is required for these rentals. These stylish cottages are located near the pavilion in the center of the resort. The bedroom contains a comfy queen-size bed and 2 nightstands. Children will love the cozy loft which has room for a full-size mattress and is accessed by a short stairway. The 3-piece bath contains a tub. The roomy kitchen is well-appointed with a full-sized refrigerator, electric stove, oven, microwave, coffee maker, toaster, and dinnerware for 4. The dining area houses a table that seats 4. In the living area is a loveseat, queen-size sleeper sofa, and a 32" flat screen TV. See our policies page for details about WiFi availability: http://rvonthego.com/florida/sherwood-forest-rv-resort/policies.